Make your family happy with a new car! Enjoy the new life in a new automobile from Happyecars.com! 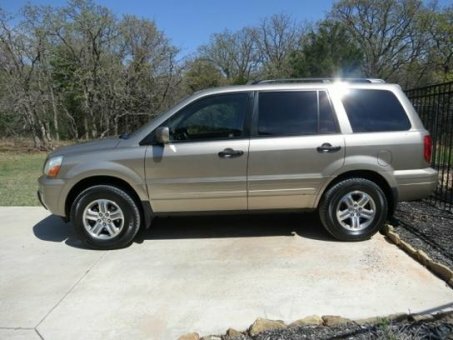 2005 Honda Pilot in very good condition for its year. No accidents, well maintained by owner, garage kept, and mostly highway miles. Exterior and interior is both tan. Clean and well maintained inside and out. Features include: leather heated seats, power seats, power sunroof, power windows, power doors, remote keyless entry, 6 disc cd player, tinted windows, roof rack, luggage rack, and upgraded wheels. This Pilot is great mechanically and all accessories work perfectly. Must experience in person to appreciate. Clean title is in hand. Happyecars.com is Online Public Auto Auction which operates all over the USA. We offer a quick search and easy car selling process. We strive to make our customers happy and offer them the safest platform for buying and selling cars online.